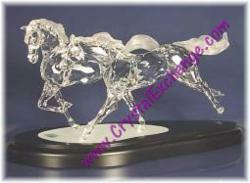 Crystal Exchange America has been online for over 15 years and is a reputable Swarovski dealer featuring retired and discontinued Swarovski, They indicate that Swarovski NLE figurines can be purchased for very low price. 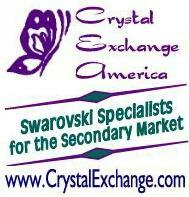 Additionally, with holiday shopping season still vibrant, Crystal Exchange America is having additional sales promotions on retired Swarovski that may be hard to pass up. We have a very motivated client who wants to sell his Swarovski NLE figurines quickly: Swarovski Bull, Swarovski Elephant, and the Swarovski Wild Horses. Crystal Exchange America is keen about some new listings for Swarovski NLE crystal figurines at significantly reduced prices. Swarovski NLE are Swarovski Numbered Limited Editions, and in the case of these particular figurines, required the original purchaser to be a member of the Swarovski SCS (Swarovski Crystal Society). The figurines at unbelievable prices include the Swarovski Wild Horses (NLE 2001), the Swarovski Bull (NLE 2004), and the Swarovski Elephant (NLE 2006). The prices on the Swarovski NLE figurines are surprisingly low. The Swarovski Wild Horses can be purchased for $4100, a $100 below original retail price in 2001. In the recent past, trends show this magnificent sculpture selling around $4500. 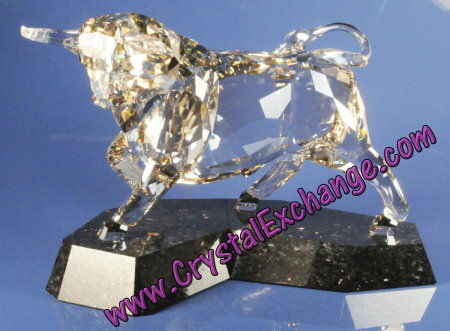 The Swarovski Bull can be purchased for $3300, a mere $300 above original retail price in 2004. Recent trends on this outstanding creation are near the $3800 range. The Swarovski Elephant can be purchased for $3300, less than $100 over original retail price in 2006. Lately, this wonderful design has been selling around $3800. Crystal Exchange America has a vast virtual inventory with a large variety of product offerings. Furthermore, they continue to see very competitive prices from many listing clients. This is awesome news for Swarovski crystal fanatics enthusiastic to buy retired Swarovski and hard-to-find Swarovski collectibles. For the avid Swarovski collector looking for more than the crystal figurines, Crystal Exchange America also sells the most popular books on Swarovski Crystal. Two of the collectors’ favorite price guides are written and published by Swarovski collectors: Warner’s Blue Ribbon Books on Swarovski.